It’s the end of July, almost three months since Roger’s death and my feelings are still raw. Roger was such a big character, full of love joy and energy and the silence created by his continued absence is almost deafening. I miss his love and support in almost every aspect of my life and not least his encouragement and challenge in building our understanding of our horses and my abilities as a horsewoman. Having decided early on to keep all four of our horses I made it my business to get on with things in my day to day life and with the horses, keeping to the commitments we had made together to attend a clinic for lessons in May, the Icelandic Horse British Championships in Dorset in June and our summer holiday with horses on Gower in South Wales in July. None of this has been easy and although I have found purpose and some enjoyment my joy is lacking and I have cried a lot. I have cried more that I thought was possible and in a way I have never experienced before, from deep within my being and perhaps more wailing than crying. Not enough time has yet passed for the sharpness of the pain to diminish but nevertheless returning to work, getting on with life and working with the horses has been the right thing for me and what I know Roger would have wanted for me. I am not so sure he would have recommended keeping all the horses though; in fact if I am honest I am sure he wouldn’t have. 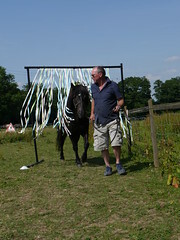 He was far less sentimental than me about the horses and would have mostly likely have said I should be more realistic and reduced to two, ‘every horse needs a job’ he said and I won’t have time to ride them all properly. He would have been right but I am stubborn as well as sentimental and he knew that too. 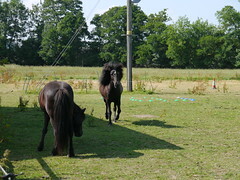 In my last blog I wrote about taking Svipur and Fleygur to the clinic in May. Fleygur had thrown in some surprises and had been reluctant to go forward. With the help of the trainer, Karen I figured that he was confused by my signals and tension and that I had to develop a new relationship with him. So over the next few weeks I paid attention to Fleygur, knowing that he was by nature an anxious horse who didn’t like change and not knowing how Roger’s sudden absence and the change in his routine might be effecting him. I rode him out with friends and on my own but focussed on keeping the rides very quiet, mostly walking and if tölting then only away from home and slow or medium speed never fast. If he became too wound up at any point I would just get off and lead him until he was well and truly calm before remounting. On most rides this meant that I walked the last section home to ensure he arrived home quiet and relaxed. I had told myself that I would probably have to walk him in hand a lot for at least three months to manage my own expectations and I told everyone I rode with that this was my plan to manage theirs! I set myself this minimum time so that I didn’t rush things or give up before my plan had any chance of working. I also changed one of Roger’s habits and stopped giving the horses a feed when we got back from a ride. Roger use to ponder about whether this was a contributory factor in Fleygur’s rush to get home and I figured they didn’t need it nutritionally during the summers months anyway so there was no harm in dropping the practice. Okay it was a ‘nice to do’ thing and Roger had described it as a treat not a necessity so in this I went for the practical option and cast Roger in the role of the sentimentalist. I didn’t ride as often as I had meant to. Returning to work was exhausting and even though I had the light in the evenings I often didn’t have the energy to ride after arriving home and getting everything else done , including having to fix the electric fencing multiple times after Svipur had broken it down, or repair yet again Jandi’s sweet itch rug after he’d torn it rubbing. There was more than one occasion when I wondered about taking up one of the offers I had to take some or all of the horses to ease my burden. I thought about it but I didn’t do it. I did begin to notice small changes in Fleygur though. He greeted me more noticeably in the field and I got more and more direct eye contact from him, and I even had one or two rides where he remained calm and steady through out. That felt good, but I reminded myself that this was what Fleygur could be like sometimes Roger would say he was ‘Mary Poppins’ meaning ‘practically perfect’ of course, and other times he would be wound up like a spring and it was rarely possible to identify a clear reason for the difference. I will return to my journey with Fleygur in part two of this blog post. 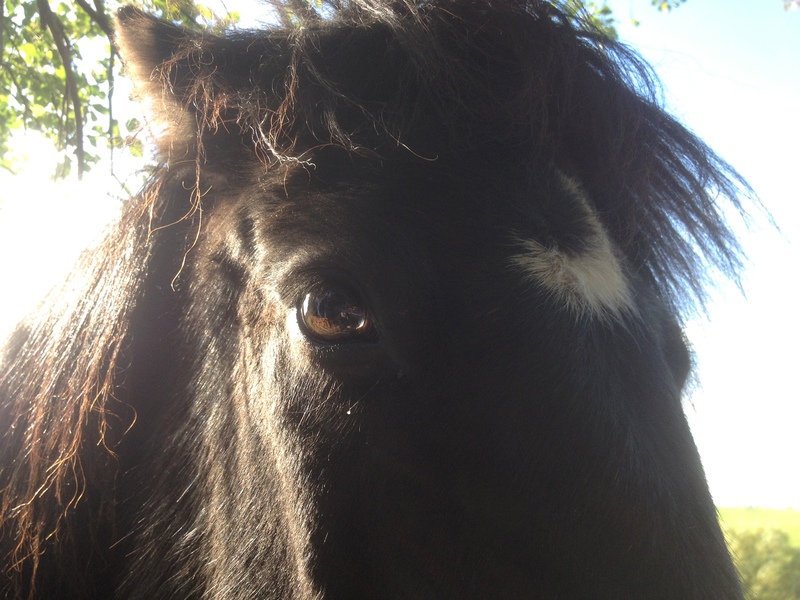 When a horse really looks you in the eyes, you know you have his attention. If you are lucky, you will have his cooperation. If you pay him attention too, you will have his loyalty. The British Championships were fast approaching and I had to decide what I was going to do. The last Show in May was just one week before Roger died. We had a great time as always and had been discussing which horses and which classes to enter at the BCs. 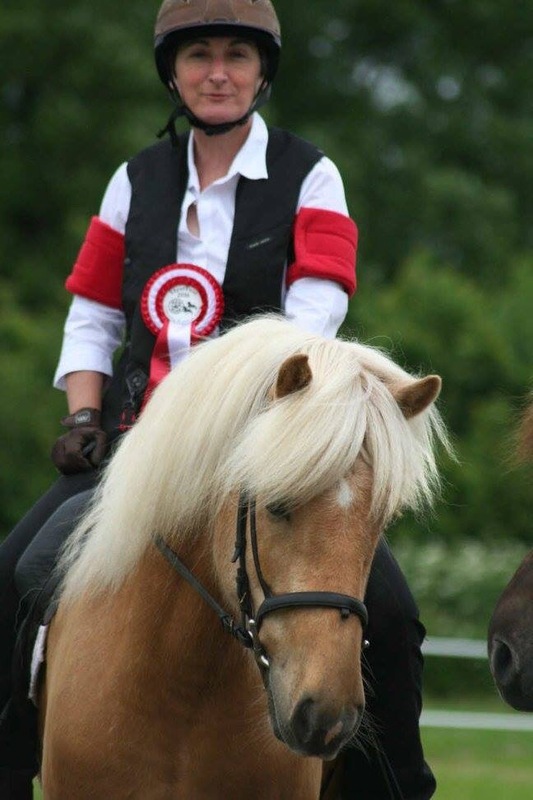 It was going to be a big deal for me just turning up, never mind deciding what to enter, transporting the horses, camping on my own, competing the whole deal, but not for the first time members of the Icelandic horse community in Britain made sure I was not allowed to drift away. 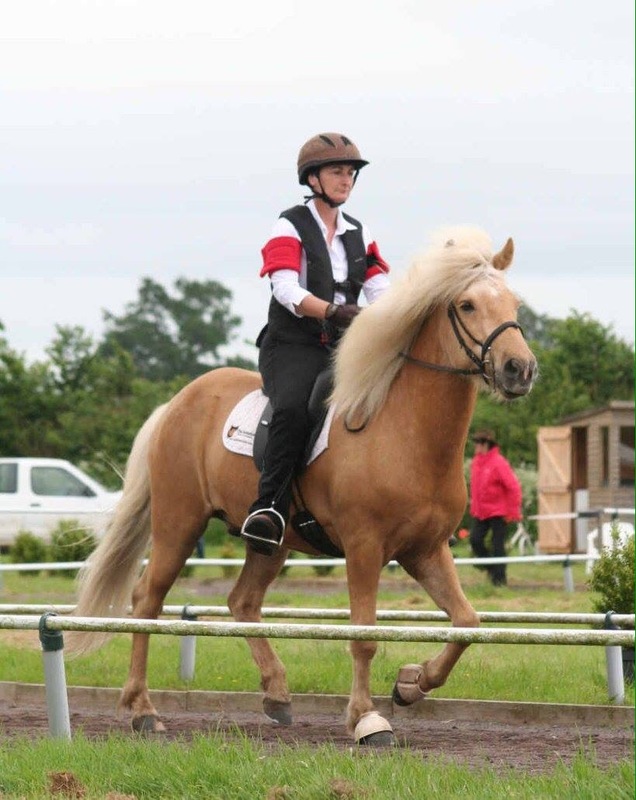 I was supported in my preparation, encouraged and even collected – me and the horses and driven to and from the Show, nearly four hours from where I live. I was fed, hugged and supported every step of the way. I decided to keep things simple and entered Svipur in the elementary tölt class. This is the class where I failed to qualify for the final at last years BCs and the class that Roger won with Fleygur two years ago. It was a lovely trophy that sat proudly on our sideboard for that year and I had told Roger it was my goal to win it as well so that both our names could be on the same trophy. Roger, worried that I would be disappointed tried to manage my expectations by telling me about all the up and coming riders and horses and urging me not to pin my hopes on wining it. I knew there were two mini shields left on the trophy and that meant just two more British Championships where I could realise my dream. Although I told no one, this was the reason I entered that class this year. I wanted to win the trophy with Rogers name on. 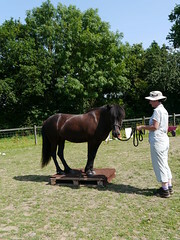 To accompany Svipur I took Jandi, for the experience and because I thought I might enter him in the Track and Trail class, the only class that can be entered up to the day of the show. This was the first show that Fleygur would not be at and I didn’t take him for two main reasons. Firstly as I have said before he was at his most difficult at shows and Roger and I often spoke of retiring him from competition as it was clearly very stressful for him. I didn’t think there would be anything to be gained in terms of my building my new relationship with Fleygur by over facing us both in this way. To go from a remedial programme of walking a horse for three months, ‘oh except for the bit where I compete him on the track’ in something that both he and I will find stressful would be nothing short of crazy. I also just didn’t think I would be able to control him on the Oval track and the last thing I needed at this point was a set back, for either of us. The Show was hard emotionally though it was good to be among friends and people shared stories and spoke of Roger often. I cried as I prepared Svipur for the qualifying class and when we qualified in first position. I worked on my relaxation, knowing that in all previous years my performance on the second day in the finals was always worse than in the qualifying rounds and there was no doubt that this competition had a higher stake for me than any before. I entered Svipur in the Track and Trail class that evening because it would give me another chance to tölt him on the Oval track and because I had worked on obstacles with him and so I thought the class would be fun! We did a great tölt but were completely useless in the obstacles and finished up coming last, pretty embarrassing for a co-founder of the event but it didn’t matter I laughed all the way round and had a great time. I had offered a friend the chance to ride Jandi but to my surprise he was really playing up, napping and not wanting to be separated from Svipur so we were about to withdraw him when one of the British Team members, Charlotte Cook offered to ride him, be my guest I said. He performed terribly on the track but despite his reluctance Charlotte and Jandi did a cracking round on the obstacles and won the class. In the evening Charlotte was presented with the new trophy for this event The Roger Bax Award and she immediately gave it to me, as the owner of the winning horse to keep for the year. Of course I cried again. 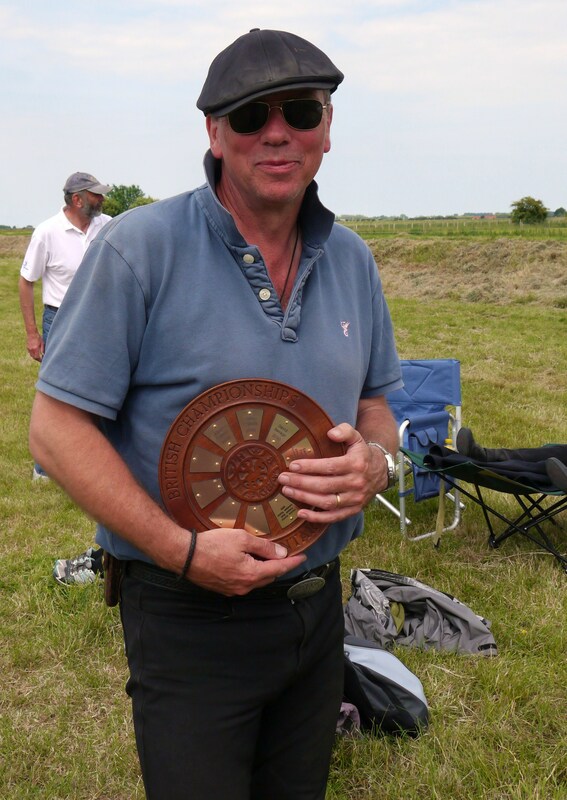 There are six more mini shields to be engraved so I have six years to win the Roger Bax Award myself! Finals day arrived. I got ready in plenty of time and could feel that Svipur was more relaxed than the previous day which was good; a relaxed horse produces a better tölt, as does a relaxed rider. The judge’s comments from the previous day had said I needed more impulsion and I wavered about whether or not to ride with a stick. I don’t usually at home and although most people do in competition I find that I am more balanced and even in my riding if I do not and I use my hands more effectively, at the last minute I decided to go in without. At the end of the first round of the Oval track I was not completely happy with my performance and when I heard the scores I knew that unless I improved they would not be good enough to win. I needed impulsion and to worry less about holding Svipur back, he needed to be able to find the speed he was comfortable with and carry himself and I must not inhibit him through my nervousness, so as we started the second round I urged him on with my legs and my core letting him go forward and felt his back end lift beneath me. I knew now all I had to do was stay relaxed and keep encouraging him forward and use my hands as lightly as possible. It felt so much better and I allowed myself to smile. We were all called for a tack check at the end of the class and as soon as I dismounted I was in floods of tears as the emotional tension broke. Tack checked completed, recomposed and remounted we awaited the scores. We had won. I will brush over the playing of God Save the Queen after the rosettes were awarded, as I know this new gesture was meant kindly and my friends were mouthing to me that they had asked for the Welsh anthem to be played, but suffice to say that as someone who is passionate about being Welsh and not a supporter of a monarchy it was a bit like when the South Korean flag was shown in the 2012 Olympics when it was North Korea who were playing, although probably a bit less likely to cause an international incident. Roger would have laughed so. In ‘Time and Feel – Part Two – Holiday in Wales’ I will write more about my journey with Fleygur and inspiration from one of Roger’s favourite horseman. A real journey of horsemanship. Putting the horse first even when you are in pieces – how grateful your herd must be and how proud Roger would have been. Don’t forget to be kind to yourself….we all struggle to ride because w havee to fix the rug, fix the fencing, sort out the latest problem. Sometimes that 5 minutes of spending time just being with the horses asking nothing and giving your heart achieves as much in a different way as riding. well done on getting through in several ways. congratulations on winning. You have taken us on a wonderful journey and I read it with a lump in my throat. Can’t wait for Part Two. You write with passion and so much love. And by the way – congratulations! I have been following your Facebook page and blog and have been thinking of you a lot. I am sure that your blog doesn’t really covey just how tough life is for you at the moment, but I am so glad that you have also managed to hang on to positives like the horses, friendships and even work. Hopefully eventually the balance will begin to tip in the right direction but in the meantime be gentle with yourself.